Expanding and deregulating the H-2B visa program (a temporary foreign worker program that allows U.S. employers to hire low-wage guestworkers from abroad temporarily for seasonal, non-agricultural jobs, mostly in landscaping, forestry, seafood processing, and hospitality) has been a top goal for business groups including the U.S. Chamber of Commerce, ImmigrationWorks USA, landscaping and seafood employers, and the Essential Worker Immigration Coalition (EWIC)—lobbyists representing employers claiming they can’t find U.S. workers willing to mow lawns, plant trees, or pick crabmeat. These lobbyists have never presented a credible case regarding labor shortages in H-2B jobs. But H-2B employers have spent millions of dollars on litigation, lobbying, and campaign contributions; anything it takes to keep wages from rising and to prevent their access to low-paid indentured foreign workers with few rights from ever being restricted. And it’s happening again. To avoid a government shutdown, Congress has to pass appropriations legislation soon to fund the entire federal government. Whenever that happens, members of Congress attempt to insert “riders,” legislative provisions tucked into appropriations bills that amend the law in substantive ways that have nothing to do with appropriations. Thanks to the aforementioned corporate lobbyists, the current 2016 fiscal year appropriations negotiations have included discussions about riders to remake the H-2B program. The omnibus bill introduced in the House on the evening of December 15 included riders that would: 1) vastly increase the size of the H-2B program, 2) eliminate protections that keep workers from being idled without work or pay for long periods of time, and 3) prevent U.S. workers from having a fair shot at getting hired for job openings by preventing enforcement of the rules that require employers to recruit workers already present in the United States before they can hire an H-2B worker. Finally—and worst of all—if the House appropriations bill becomes law it will also dramatically lower the wage rates employers are required to pay, which would permit employers to pay their H-2B workers much less than American workers employed in the same jobs and local area. Needless to say, the lower wages H-2B workers will be paid create a huge incentive to hire temporary foreign workers instead of the local U.S. workers who reside in communities where the jobs are located. In addition, legislation in the House and Senate has been introduced that would permanently implement these changes, including reducing H-2B wage rates, expanding the size of the H-2B program to about 200,000, and repealing all of the protections for foreign and American workers that the Obama administration just implemented in April 2015, after fighting opposition to them from corporate lobbyists and Congress for the past five years. Sadly, the legislator spearheading both the legislative and appropriations efforts to weaken H-2B rules on behalf of corporate lobbyists is a Democrat, Sen. Barbara Mikulski. Employers love the H-2B program because it lets them pay low wages to temporary foreign workers who are indentured to them. Under the rules of the program, H-2B workers don’t have the legal right to switch employers if they aren’t paid the correct wage or if they have to work in unsafe conditions. If an H-2B worker gets fired, he or she becomes instantly deportable. Over the years, numerous reports have documented just how bad the H-2B program has been for foreign workers and Americans alike. “Close to Slavery” from the Southern Poverty Law Center, and more recently, two great pieces of investigative journalism from Buzzfeed, “All You Americans Are Fired” and “The New American Slavery: Invited To The U.S., Foreign Workers Find A Nightmare,” have unveiled the true nature of the H-2B program: it facilitates the exploitation and human trafficking of foreign workers and leaves many Americans out of work. What hasn’t been previously documented is how wages for workers in the United States in the top H-2B occupations have fared, and what the unemployment rates have been in those occupations. Here’s a quick snapshot, which comes from a forthcoming paper on H-2B that EPI will publish in the coming weeks. The table below lists the top 15 H-2B occupations in fiscal year 2014, along with the number of H-2B jobs that were certified by the U.S. Department of Labor in each occupation. To the right of that, the average hourly wage nationwide in 2004 and 2014 for each occupation is listed (adjusted to 2014 dollars). The final two columns list how much those wages increased or decreased over the 2004 to 2014 period, in dollar and percentage terms. ** Hourly wage rate was unavailable for this occupation, so an hourly wage rate was estimated by dividing the average annual salary by 2080 hours (52 weeks times 40 hours). Note: All values are adjusted to 2014 dollars. SOC stands for Standard Occupational Classification system used by federal agencies to classify workers into occupational categories. Data set excludes records from original labeled "certification expired" and "partial certification expired" because expired records were not likely to become approved USCIS H-2B petitions or visas issued by the State Department. 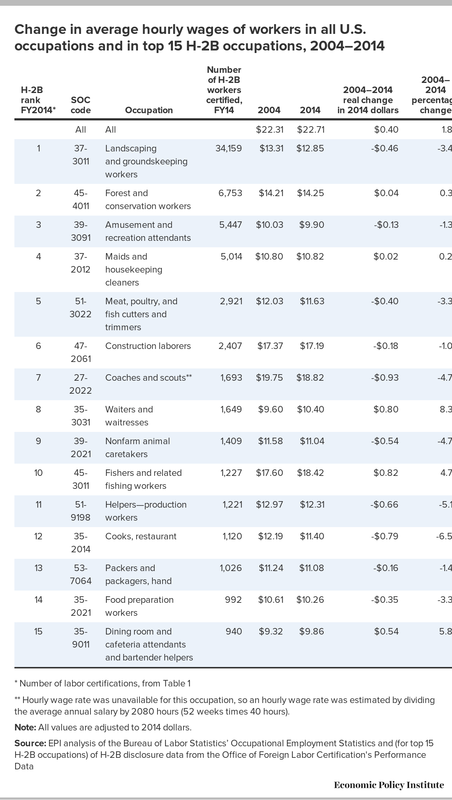 As the table clearly shows, from 2004 to 2014, there was no significant wage growth for workers in the top H-2B occupations. In fact, wages were stagnant or declining for workers in all of the top 15 H-2B occupations between 2004 and 2014. The occupation that saw the most wage growth in 2014 dollars was “Fishers and Related Fishing Workers,” where wages rose by $0.82 over 10 years, an average of 8.2 cents per year. The top H-2B occupation by far every year is “Landscaping and Groundskeeping Workers,” which usually accounts for around 40 percent of all H-2B jobs. In that occupation, wages decreased by $0.46 from 2004 to 2014, a total decrease in real terms of 3.4 percent. Note: The occupational titles differ in some cases with those in Tables 1-11 because this figure uses Current Population Survey data to calculate occupational unemployment rates. Specifically, the CPS occupational titles vary slightly in some cases from the Standard Occupation Classification (SOC) codes used in the report and Tables 1-11 for the top 15 H-2B occupations. The 15 occupations listed here correspond to the H-2B occupations with the 15 largest numbers of certifications in fiscal 2014 even if the occupational titles differ slightly in some cases. Unemployment rates increased in all but one of the top 15 H-2B occupations between 2004 and 2014, and all 15 occupations averaged very high unemployment rates in 2013–14. In 11 of the top 15 H-2B occupations, unemployment dropped from 2004–5 to 2006–7, but then rose significantly between 2006–7 and 2013–14. “Grounds maintenance workers,” which corresponds to the top H-2B occupation of Landscaping and Groundskeeping Workers (SOC code 37-3011), had an average unemployment rate of 12.7 percent during 2013–14, more than double the national unemployment rate. No one who takes an honest look at what’s been happening in the main occupations for which employers hire H-2B workers can say there are national-level labor shortages, or that there have been shortages over the past decade. Flat and declining wages coupled with such high unemployment rates over such a long period of time suggest a loose labor market—an over-supply of workers rather than an under-supply—in the top 15 H-2B occupations. While it is possible that shortages exist in a few local areas, the high national unemployment rates in H-2B occupations suggest that even the employers experiencing a local labor shortage might find available workers elsewhere in the United States if they recruited outside their local city, region, or state, or if they offered more attractive wages and benefits (including transportation and housing, which they have to offer to agricultural guestworkers in the H-2A visa program). Instead of passing legislation or hijacking the appropriations process to make it easier for H-2B employers to exploit and underpay foreign workers in landscaping, seafood, and other low-wage occupations, the conference committee that negotiates a compromise appropriations bill between the House and Senate should remove all of the provisions affecting the H-2B visa. And then Congress should get to work on passing laws that protect U.S. wage standards and put unemployed Americans back to work, while also ensuring that the 100,000 H-2B workers in the country—who traveled thousands of miles to mow lawns, plant trees, and clean hotel rooms for very low pay—are treated fairly and with dignity.